Namba is one of Osaka’s leading terminal stations. It is located near major Osaka sightseeing spots like Dotonbori and the Shinsaibashi shopping street. Namba Station also offers fast access to Kansai International Airport (KIX), travel time is only about 35 minutes via the limited express rapi:t train. This makes it a very convenient place to use as a base when traveling around Osaka. In this article will take a look at the differences between the six Namba Stations, and point out sightseeing areas that are easily accessible from each one. *Some stations have Namba written on their signs in kanji while others are displayed in hiragana. In general, people follow the reading for each station but refer to them all collectively using the kanji for Namba. What are the Six Namba Stations? These are the six Namba Stations. Nankai Namba Station is the only one aboveground, while the others are all underground. Nankai Namba consists of a giant station building, so when entering the station from aboveground. It can easily be used as your starting pointas it is difficult to miss. JR Namba Station and Namba Station on the Yotsubashi Line are about five to ten minutes away on foot. The others are roughly in the same place. If you look at the signs while moving forward, you shouldn’t get too mixed up. Since all of the stations are named Namba Station, better ask where a specific line is instead of asking where Namba Station is. Asking “Where’s the Nankai Line?” or “Where’s the Midosuji Line?” will get you better, more specific results. Next, let’s take a look at tourist spots that are easily accessible from each station! The Nankai Namba Station is the only Namba Station at street level. This large combined building is home to the station, the Takashimaya department store and various shops. The rapi:t limited express train runs from Nankai Namba Station and arrives at KIX without any need for transfer, making it very convenient for visitors. You can also reach Mt. Koya by train from here. 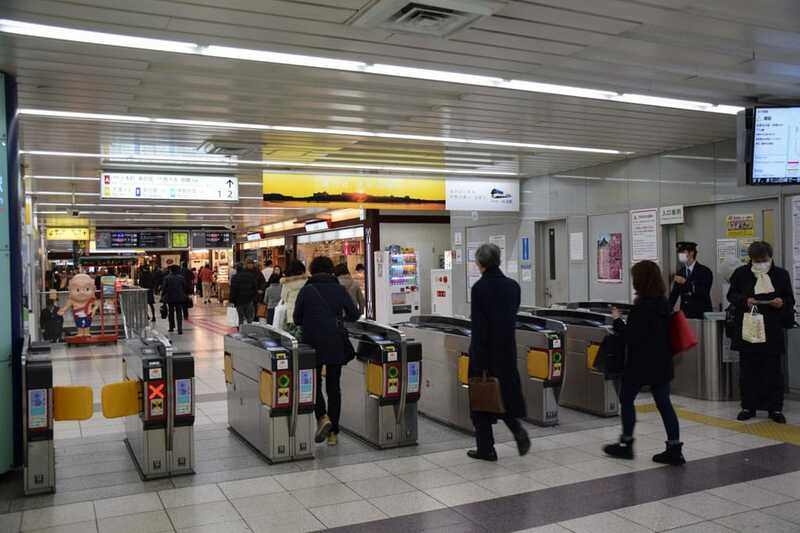 Let us explain how to get to the ticket gates at the Nankai Namba Station. Enter the building and go through the first floor to the escalator, pictured above. There are ticket gates on the 2nd floor and 3rd floor. The platforms bound for KIX and Mt. Koya are both on the 3rd floor. Take the escalator on the right, which will take you directly to the 3rd floor. This is the Nankai Line ticket gate. The ticket counter and information booth are pictured on the left. The language setting on the ticket machine can be changed to English, Chinese or Korean. If you are not sure about something you can ask for help at the tourist information center next to the escalator on the 1st floor. The limited express from KIX to Nankai Namba Station takes about 45 minutes (920 yen), and the rapi:t about 40 minutes (1,430 yen). The Nankai homepage offers discounts on tickets for the rapi:t, so we recommend checking before you buy the tickets at the station. Take the “Limited Express Koya” from Nankai Namba Station and get off at Gokurakubashi Station (90 minutes, 2,040 yen). From there, you can take the cable car to Mt. Koya. Both the Kintetsu line and the Hanshin line run through Osaka Namba Station. They are different lines but occupy the same station. Take the Kintetsu line to get to Nara, and the Hanshin line to head towards Hyogo. Osaka Namba Station provides easy access to Nara via the Kintetsu line, and to USJ (Universal Studios Japan) and Kobe via the Hanshin line. To get to USJ, take the Hanshin line to Universal City Station. You’ll need to transfer once to the Yumesaki Line. On that same train, you can get to Kobe-Sannomiya Station located in the center of Kobe without making any transfers. To get to Nara, take the Kintetsu line to Kintetsu-Nara Station. You won’t need to make any transfers. Transfer at Nishi-Kujo Station to the Yumesaki Line and get off the train at Universal City Station. You will get there in about 25 minutes (260 yen). Get off the train at Kobe-Sannomiya Station. It will take about 45 minutes on the rapid train (410 yen) and there is no need to transfer. Exit the train at Kintetsu-Nara Station. You don't need to transfer and will get there in 45 minutes (410 yen). The Midosuji Line, the Yotsubashi Line, and the Sennichimae Line are all part of the Osaka Metro subway system. The subway lines are connected inside the station, so you can switch lines without exiting the ticket gate. The Osaka Metro lines are all color-coded. As seen in the picture above, the station guide denotes each line by encircling the first letter of the line with its color. The Midosuji Line (M) is reded, the Yotsubashi Line (Y) is Blue and the Sennichimae Line (S) is Pink. The Midosuji Line is very easy to use. The Osaka hub of Umeda Station, the Shinkansen stop at Shin-Osaka Station and Dobutsuenmae Station by Tsutenkaku are all stations on the Midosuji line. You can also walk one station over to Shinsaibashi Station (about 15 minutes on foot). There are several street-level entrances around Nankai Namba Station. You just have to go down the stairs to access the subway. There are station guides at each entrance, you can use them for reference. No transfers needed, the travel time is about five minutes (180 yen). No transfers needed, the travel time is about 10 minutes (230 yen). No transfers needed, the travel time is about 15 minutes (280 yen). Yotsubashi Namba Station is a bit farther away from the other subway stations. It’s located on the way to JR Namba Station and five minutes on foot from Nankai Namba Station. Yotsubashi Station, only one station from Yotsubashi Namba Station, is the closest station to the fashion haven Americamura. The line is marked with a Y inside a blue circle. No transfers and it takes only one minute by train (180 yen). The Sennichimae Line stops at Nipponbashi station. The is the closest access point to the Osaka's electronics district Nipponbashi. It also stops at Tsuruhashi Station, which is where Koreatown and a concentration of yakiniku (grilled meat) restaurants are located. The line is marked with an S inside a pink circle. No transfers and the travel time is only one minute (180 yen). No transfers and the travel time is about five minutes (180 yen). JR Namba Station is located in a different place than the other Namba stations. You can access the World Heritage site Horyuji via Horyuji Station, as well as Nara Station and other famous spots using this line. JR Namba Station can be accessed from aboveground, but getting there this way is complicated. We recommend accessing it via the underground corridors instead. From Nankai Namba Station, it’s about five to ten minutes on foot. As you head toward JR Namba Station through the underground shopping arcades, you will eventually enter the Namba WALK (pictured above), lined by restaurants and shops on both sides. You might wonder, “Is this really the right way to the JR?”. Yes, it is! Just keep going. Once you see the moving walkway, JR Namba Station is right ahead. Take the Yamatoji Line rapid train and get off at Horyuji Station. You will travel for about 35 minutes (460 yen). The bus terminal, known as OCAT, can be entered through this building. OCAT, located on the 2nd floor of JR Namba Station, is the highway bus terminal. Limousine buses to KIX and Osaka International Airport, as well as highway buses to destinations all over Japan, depart and arrive here. It can be difficult to find. Enter the building and you’ll see an escalator, but don’t get on. Go along the left-hand path in the photo and get on that escalator instead. Go up and you will see the arrival and departure area on the 2nd floor. There is a concentration of popular sightseeing and shopping spots around Namba Station. Shinsaibashi and Dotonbori are only five to ten minutes away on foot. Shinsekai and Tsutenkaku are five minutes away on the Midosuji line. You can easily find Osaka’s famous kushikatsu (grilled meat and vegetables on a skewer), takoyaki and other famous Osaka dishes at the restaurants around Namba station. If you keep the points in the article in mind, you should be able to navigate your way through Namba Station more efficiently and comfortably. In addition to this article, we have also created a guide to the all-access public transportation passes in Kansai, which will surely be useful when traveling to and in Osaka. Enjoy your trip! This is a rewrite of an article originally published on June 3rd, 2016. How To Get To All 5 Umeda Stations From JR Osaka Station!